I knew that writing a post about why you should take down your bulletin boards would ruffle a few feathers….and that’s OK! It was really a challenge to think about things in a different way. So often we do things out of habit or because we think that we have to, that we don’t even stop to consider that there might be an alternative. But if you are considering taking down a bulletin board – and aren’t quite sure what to put in its place – I’ve put together a list of 10 ideas. 1) Re-purpose It: Instead of decorating the bulletin board, could you use it to display program flyers? Or partner with your local school and display children’s artwork on the board (maybe the school would even do the work for you)? Or what about using it as a community bulletin board where individuals can advertise upcoming events, or MOMS club, or summer camps, etc.? 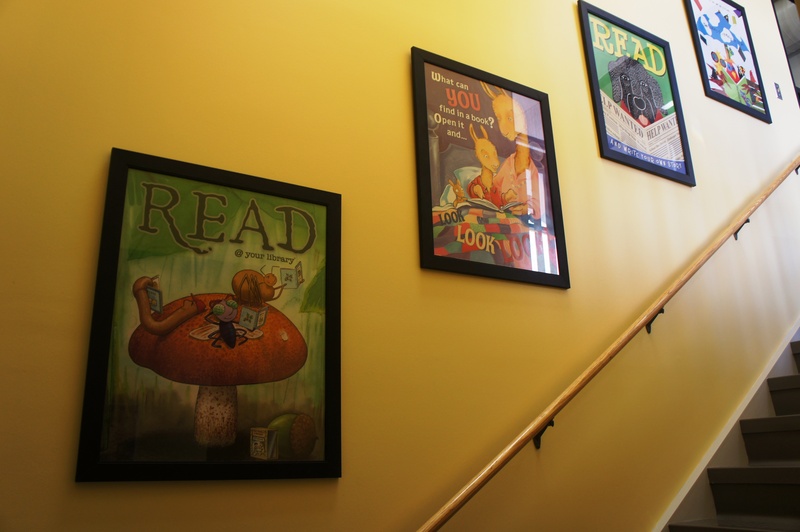 2) Framed Artwork: Do your bulletin boards add color and life to your children’s library? Then consider replacing them with framed artwork to brighten up the place. You can find some great library posters to fill them (check out the ALA store) or use a fun geometric piece of fabric! 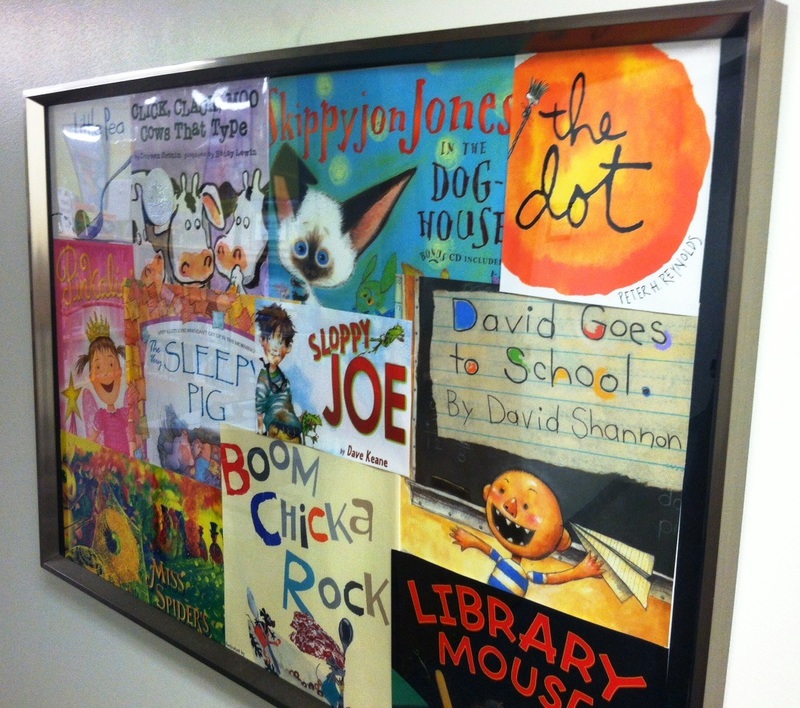 You can even make a collage of children’s artwork or book covers to fill the frames. Mollie made our book cover collage. The great thing about using frames is that it’s easy to switch-out the artwork. But you only have to change them out when you want to, not because you have to. That’s one of the things that I like least about bulletin boards; they make you feel “trapped” into decorating. You can’t leave a bulletin board empty – it screams “I’m empty! Someone forgot to decorate me!” And being forced to decorate the same 12-square-foot rectangle can feel like being put in a box (is that just me??) The framed artwork always looks like it belongs, even when we don’t have time to switch them out. 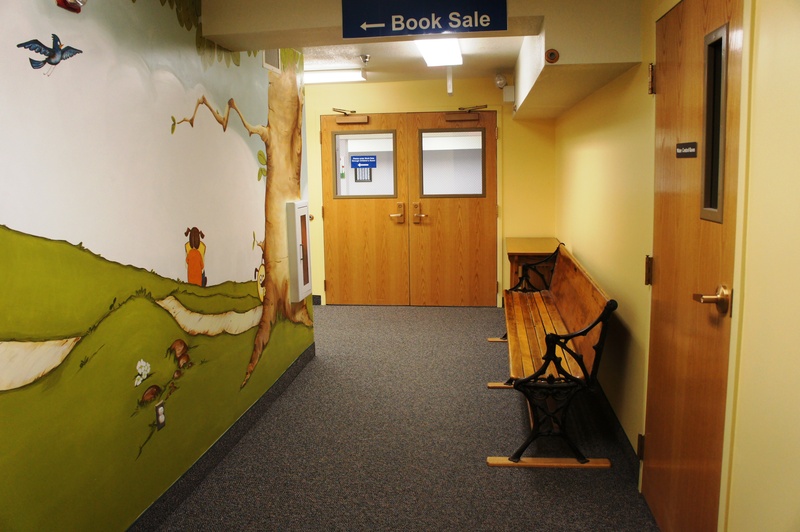 3) Paint/Mural: Another, but more permanent, way to add some color to your children’s library it to paint a mural on the wall where a bulletin board once lived. Know an artist that would love the opportunity to paint for you? Use their talent! Just be sure to pick something that you really like because it will be there for a while! If you don’t like the idea of a mural, how about just painting the wall one, bright color? 4) A Bookshelf: Running out of room for your books? You could add another bookshelf. Or maybe your current bookshelves are pretty close together. Could you rearrange to open up the space a bit? There was once a large bulletin hanging here. We rearranged our shelves and replaced the bulletin board with bookshelves. I’m also a fan of these magnetic strips (from three by three seattle.) They come in 11 colors and look like a colorful stripe on the wall when not in use. But they are handy for hanging papers or artwork. They also come in polka dots, squares, and flower shapes! These replaced a bulletin board in our storytime/meeting room. 6) DIY Canvas Artwork: Not artistically inclined? Does the thought of filling a blank canvas send shivers down your spine? That’s OK. You don’t have to be an artist to create some colorful artwork. You could make a melted crayon canvas. Or how about this watercolor bubble art? Or how about covering a canvas with pages from a children’s book using Mod Podge? 7) A Word or Letters: You can purchase wooden or paper mache letters at your local craft stores for a few dollars a piece, and then spray paint them, Mod Podge them, cover them in mosaic tiles, or even pennies. 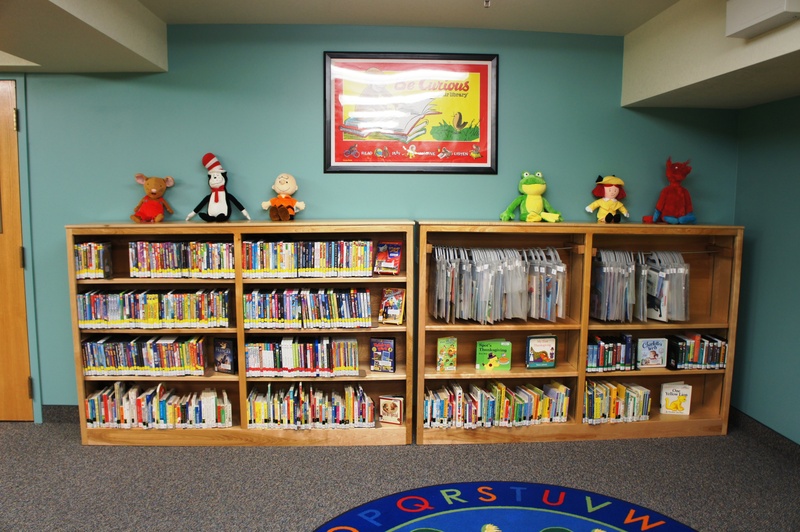 Put up the alphabet, or spell out “Children’s Library” or “Welcome” or anything your heart desires. Just search for ‘paper mache letters’ on Pinterest and you will find tons of ideas. 8) Slat Wall: I’d love to have slat wall someday. *sigh* You can create book displays and face-out your books for easy browsing. Fun, practical, and great for increasing your circ numbers. Check out this colorful display from the Book Shop, Souix Falls. Doesn’t it just make you want to grab those books and read? 9) Vinyl Wall Decals: These are great because they are fairly inexpensive and removable. You can find tons of different artwork, characters, and words! Search any big stores (Target, Walmart, Amazon etc.) or Etsy and you’ll be sure to find something that you like. 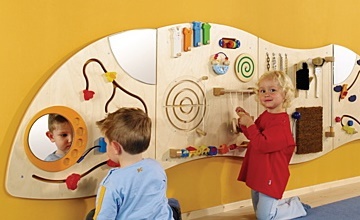 10) Interactive Learning Wall: This one is quite a bit more expensive than the other ideas, but certainly worth mentioning. There are tons of different activity walls made specifically for libraries that you can purchase. They look colorful and fun, and they are usually multi-sensory, keep children entertained, while promoting fine motor skills. Win-win! June 13, 2014 in Library Design & Displays. I love how you threw down the gauntlet in your first post (free yourself) and then kindly share alternatives that work way better! Go you!! This sounds awesome! I bet it looks wonderful 🙂 What shelves did you purchase from IKEA? Can you share the link if you have it?